This week, the common theme for these three RPG Kickstarters is I’ve interviewed the creators about these projects. Matthew A. Bogdan on RPG Stock Art. Ed Jowett right here at the Tessera Guild. Brian Colin on the Open Gaming Network. Each shared their thoughts with me and I appreciated that. In turn, I wanted to round up their campaigns for everyone to see. Disclaimer: I am a creator on this book. “James Ward, Lenard Lakofka, Johnn Four and many more share some of their pro tips on how to create your first fantasy RPG adventure! I am publishing 2 books and an optional Fantasy RPG resource bundle worth several times the price I have foolishly attached to it! ; ) As of this writing, I have several interviews ready to begin or complete. I am currently focusing on the following RPG creators listed below. I will provide a table of contents very soon, but I must gauge how things go, and not bite off more than I can chew or get presumptuous. The current team I have been incredibly pleased with being graced with includes James M. Ward, Lenard Lakofka, Johnn Four, Rick Hershey, Lucus Palosaari, Kevin Watson, Bobby Nash and Egg Embry. I am quite pleased to have several thousand words of quality content from interviews that I have conducted with some of these very high quality creators with great track records.Recently, I have also received some great tips from Egg Embry and Kevin Watson, as well as a complete article from Lucus Palosaari and some really cool step-by-step content from Lenard Lakofka. In short, I am truly and genuinely excited about this project! Directories will be added with any participating freelancers as well. We will be providing a source that is primarily geared for beginner self-publishers. This resource is being designed to provide a small, future adventure design or game company the tools they need to create their first fantasy roleplaying game adventure. BUT, it can most definitely be for ANYONE wishing to improved their craft of adventure building for fun or potential commercial publishing. This product includes options that currently include digital PDF books, with the possibility of providing printed softcover and hardcover versions. Overnight success is NOT at all guaranteed in this field, and almost always takes time and patience, networking, making the right decisions and sticking to a strict or tight starting budget. That said, I believe that this resource will provide a solid source for you to get started and get published, along with gaining all of the proven resources that you will need in order to give you a very solid chance. At the very least, I am quite sure you will get several useful tips on adventure creation! • A Very Special Section on Dealing With TROLLS, and much, MUCH more. On RPG Stock Art, I spoke with Matthew A. Bogdan (my employer on that project). He gets in-depth about the creators, the package that we’re delivering, the stock art that comes with it, and why this is perfect for publishers to pick-up. Check it out here. Ends on Sun, September 16 2018 4:30 PM EDT. With the help of experts on the system and the writers you’ll recognise from our other games, plus the legendary talents of some industry greats, we’ve created a brand new game which you will love! This is not only a detailed and immersive world, but includes mechanics which support the genre of the game, drawing the players into the chilling reality of the Lost Lands and the fight against the Anonassi. It’s the crawling sensation on the back of the neck, the insistent, niggling feeling that we’re being followed. It’s the feeling that there are eyes in the dark, watching. Waiting. In that moment, you know – just know – that there is a clawed hand reaching toward the back of your head. Sometimes we stay still and try to ignore the feeling. Sometimes we whirl around, but there’s nothing there. Then we laugh, pass it off as imagination, and go on with our lives. But… what if… what if there really was something there, but you just weren’t able to see it? Our dimension of Aether, the bridge formed by the Lost Lands and the dying, dark dimension of Erebus. In this game, you will take the role of one of the Chosen, the small number of individuals who can see the Anonassi and the paths into the “Lost Lands” where they amass their forces. For those of you that have read my interviews over the years, you know I’ve followed Ed Jowett for a long time and interviewed him about Era: Balam, Era: The Consortium, Era: The Empowered, and Battlecruiser Alamo RPG (Powered by Era d10). For Era: The Chosen, I spoke with him here. If you’re on the fence about a horror RPG that runs across centuries, try his interview. Ends on Tue, September 18 2018 9:00 PM EDT. “Our dungeon building card deck modules are perfect for your favorite roleplaying games. New monsters & magic items for each deck! 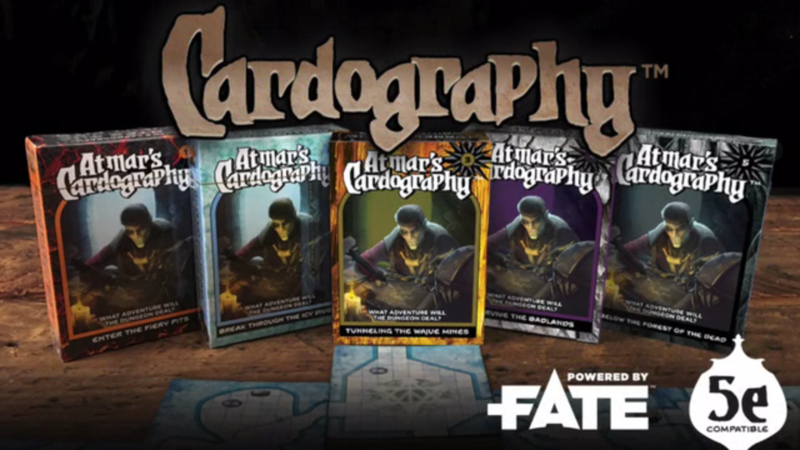 Whether you’ve been role-playing for years or you’re just now learning about this amazing hobby, Cardography is certain to enhance your adventures. We have created 3 new unique Cardography dungeon decks, along with our first two initial decks, set in the original world of Revilo. Contained in each of the themed decks are 52 dungeon cards that can be configured in countless ways. Each deck has downloadable pdfs of full adventure modules for both 5e and Fate with new, never before seen monsters, magic items, and NPCs to help add more flavor to your game. Best of all, each of the pdfs is converted for these major RPG systems: Fate and D&D 5th Edition. The modules can be played in their entirety or as a choose-your-own-adventure style dungeon crawl. On the Open Gaming Network, I have an interview with Brian Colin about this Kickstarter. Brian does an excellent job of explaining why his dungeon-building deck of cards is right for your gaming table. Read it here.